Wood offers a warm, classic look, so it’s no wonder so many people choose it for floors and furniture pieces. All that wood can get a bit tricky to mix, though. Do you match wood furniture and wood floors? Do you go with contrasting colors? Does color matter? It may seem intimidating, but our insider tips on mixing wood furniture with wood floors make the task much easier. You want your furniture and flooring to reflect your style and present favorably — that’s a given. In a 2013 study on furniture choice and habits, roughly 67-72 percent of participants said they feel that their furniture expresses their individuality, and their homes should have something to say about them. And wood furniture is always a favorite. In fact, when respondents in the same study were asked about how long they thought their furniture would last, 92.4 percent chose wood as the most reliable. So how can you incorporate classy, quality wood furniture into a room with hardwood flooring in a way that complements the space and matches your preferences? The answer might be different than you think. Matching the finish of your furniture and floors seems like a safe choice. How can you go wrong when you use the same color for both? It is an option, but there are a few reasons you may want to avoid the matching route. First, matching all the wood in the room can make the space seem flat and boring. Think of it as too much of a good thing. When all the wood is the same color, it blends together and loses its charm. Nothing stands out as unique. By mixing different finishes, you add visual depth and interest to the space. The pieces pop and show off individual charm and beauty. Working in different wood finishes creates an inviting feeling in your room. The space becomes homey. Matching all the wood elements can feel like you’re trying too hard. Another challenge with matching the wood finishes exactly is the fact that most people don’t buy everything at once. Older pieces often have an aged look about them, so even if they have the same finish, it won’t necessarily look the same as a new piece with that finish. Some people intentionally choose different pieces instead of a matching set to create an eclectic, updated look. That doesn’t mean you can’t have any woods match, but you may want to bring in contrasting colors to add some dimension to the space. Looking at the different characteristics of the wood finishes can help you find pieces that work well with the color of your existing wood floors. The color of the finish is only one aspect of how wood looks, whether you’re talking about the floor or your furniture pieces. Several elements work together to create the final look of a wood piece. Before you can compare these features and find ones that work together, it’s important to understand them. Wood species: The type of wood the piece is made of affects how it looks, even if the piece is stained. Wood type also affects things like quality and durability. Grain: Different types of wood have different grain appearance. Some have distinct, prominent grain patterns that stand out. Others have subtle wood grain patterns that are less noticeable. Grains can appear straight, swirly or patterned in other ways. Stain: Wood floors and wood furniture can be stained to change the color of the original wood. Stain can make the wood take on a different color or a darker look. Wood flooring provides a classy touch for any home. Did you know that 54% of home buyers are more likely to purchase or pay a higher price for a house with hardwood flooring? If you already own a home with hardwood floors, you’ll want to do your best to accentuate the authentic beauty of your flooring as much as possible. Here’s how. Since your wood floor is already installed, it’s easiest to start there and choose other wood pieces that complement it. Before shopping for new wood furniture, get a close look at your wood flooring to learn more about it. Look at things like the coloring, how dark or light the flooring appears, the grain patterns and any other unique characteristics. If you have a sample of your flooring, take it with you when you look at furniture to see how well it works with different pieces. Mixing wood finishes that work well together is a good thing, but you don’t want to have too many different finishes within one space. When you pull in too many different wood looks, the space can seem busy, mismatched, scattered or disconnected. 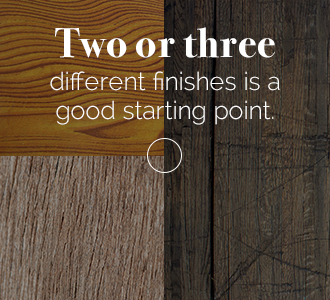 Two or three different finishes is a good starting point. If you have a huge area to furnish, using four different finishes can work. Spaces tend to work best when you have one dominant wood finish. Since you’re working in a space with wood floors, the finish of your floor is likely going to be the dominant color. It is the one constant that covers the entire room and isn’t going to change unless you go through the involved refinishing process. The other one or two finishes will complement that main wood tone. Once you have your color choices, repeat them throughout the space. You might choose to hang dark wood picture frames similar to the dark wood floor while pulling in a lighter wood finish on the dining table and hutch. Using each wood finish more than once ties the room together and creates a sense of balance. Picking wood types to go together can seem tricky. You don’t want the wood tones to be too similar, but you also don’t want too many completely different finishes. Mismatching wood pieces can create a disconnected, overly busy feeling that detracts from the pieces. Instead, find at least one trait that the different woods have in common. You might choose two pieces with similar large grain patterns, or you could pick two types of wood with rustic tones. The two kinds of wood might still look completely different, but they have that common trait to unify them. To create balance in the room, use the area to spread out the different wood tones you choose. Instead of clumping all pieces of one color together, place them in different parts of the room. If you have a rich mahogany piece on one side of the room, balance it with a similarly colored piece on the other side. This distribution of the finishes creates a more natural look without making one part of the room seem heavier or darker than others. Wood can have undertones, or subtle coloring, that affect the overall look of the piece. The undertones of your wood floor and wood furniture pieces should work together. Undertones can be warm, cool or neutral in appearance. Warm tones in wood tend to appear yellow, orange or red. If the wood takes on a gray color, it has cool undertones. Neutral undertones give wood a beige appearance without any distinct coloring. Since the wood floor isn’t easy to change, focus on the undertones in that wood first. Woods with the same type of undertones typically work best together. For example, if your wood floor has warm undertones, look for other wood pieces with warm undertones, as well. You’ll get the best results if you choose undertones of the same specific hue. If your floors have red undertones, choose furniture pieces that also have red undertones. If your floor takes on a yellowish look, pick furniture that also has that yellow tone. If your wood flooring has neutral undertones, you’re in luck. You can go with warm, cool or neutral woods because they all look great with the neutral wood flooring. However, if you add multiple wood finishes to the neutral room, make sure all those additional wood pieces have similar undertones. Keep in mind that undertone isn’t the same as the darkness of the wood. A piece can have red undertones and be very light, very dark or somewhere in between. While the pieces you choose might all have red undertones, you can create variety by choosing pieces of different darkness levels and with other unique characteristics, such as different wood grain patterns. Mixing wood floors with wood furniture becomes easier with pieces that appear natural. In nature, many different types of wood grow together harmoniously. By keeping your wood pieces as close to that natural state as possible, you can better coordinate the pieces. Wood with a heavy shellac coat ends up looking unnaturally shiny and smooth. The sheen takes away a lot of the wood’s natural beauty and characteristics that make it easier to pair with other woods. Choose pieces with natural stains and finishes to allow for greater versatility when it comes to matching different wood pieces. Grain refers to the lines and patterns that naturally occur in the wood. As the wood grows, grain develops based on the cells in the wood. The wood species often determines the general type of grain because the growth patterns vary from one species to the next. However, each piece of wood has its own distinct patterning, even within the same species. Some wood types have prominent grain patterns while others are less noticeable. That difference shows in the finished product, especially in pieces with natural finishes. Grain is described as open or closed. Open grain patterns occur in wood with large pores, such as pine, elm, ash and oak. The wood often has a coarse appearance. It may look more textured than smooth. Closed grain wood has smaller pores that minimize the appearance of the lines and markings. Also known as fine grain, this wood type includes maple, birch, alder, cherry and hickory. Grain also varies in how the patterns appear. Some wood species feature a straight grain. The lines in the wood follow a relatively straight path. These woods tend to be a little subtler in appearance than other wood grains. Some wood species have unique grain patterns that might appear wavy, swirly, twisty or otherwise different designs. They stand out in the finished wood floor or wood furniture piece because they are often irregular and more noticeable than straight lines. The grain type affects the style or mood the wood creates. Large grain patterns tend to evoke a casual tone. Fine grain patterns are associated with formal styles. Keep these feelings in mind when picking pieces for your space so you can create an overall tone that matches your style. Grain is an important feature when picking different wood pieces to go together. You don’t have to try to match the grains exactly. However, if you have too many pieces with prominent grains that look completely different, they can compete with one another instead of creating a harmonious look in the room. If you choose a piece or have a floor with a prominent grain, balance it out with other pieces that have subdued grain patterning. If all your pieces have a prominent grain, they should have a similar pattern to help them fit together. If you want to emphasize one piece of furniture or a certain part of the room, choose a finish color that contrasts with the other wood elements in the space. You might choose a dark dining room table to contrast with light wood floors, for instance. The contrast doesn’t have to be too strong. You can pair a light tone with a medium tone featuring the same undertones, for example. A dark wood tone, such as mahogany or cherry, can have ample contrast with a medium wood tone. Texture is another way to make a piece stand out and to create dimension in your space. If your wood floors are perfectly smooth and polished, choose a chunky, rustic furniture piece with lots of texture for contrast. The colors you use for your walls, window coverings, decorations, rugs and accent pieces play a role in how the wood pieces work together. A wood furniture piece can look completely different against a neutral white background than it does against a bright yellow wall. If you use several different wood finishes in one space, neutral colors for the walls and other elements tend to work best. The neutral palette helps tie the different wood tones together and create a sense of balance in the room. Having wood floors and wood furniture can sometimes feel a bit overwhelming if you don’t have anything to balance all that wood. Incorporate softer materials into the room to balance the space. Area rugs work well in rooms with wood floors. The rugs break up the wood look and add a soft feeling underfoot. An area rug is also a good visual break between the floor and the wood furniture, which can help you feel more comfortable mixing woods. Cushions and throw pillows on furniture also help break up a large area of wood. You can also work in other material types to tone down the wood look. You might incorporate a metal lamp or glass accent pieces, for example. Contrast helps create depth, but you can combine dark wood furniture with dark wood floors and still make the room look interesting. Dark wood finishes tend to have a formal look, and they add a dramatic touch to your space. The key is providing some balance to offset the dark wood so the entire room doesn’t feel heavy, dark and cave-like. One trick is to choose furniture that is a few shades lighter than the floor, especially if the wood floor is extremely dark. You still get the dark furniture look, but you help lighten the room overall. Another option is to pull in some much lighter wood pieces to offset all the dark finishes. To help create that balance, try two-toned furniture with lighter tops and legs that match the dark floor color. Another important factor in a room with dark wood floors and dark wood furniture is the rest of the room’s color palette. Pairing lighter walls with the dark wood elements helps keep the room balanced overall. Crisp white walls work well with darker woods, but you can go with other light shades, such as light grey or cream. Provide a light-colored break between dark wood floors and dark wood furniture with a light-colored area rug. For example, place a soft grey area rug under a dark wood dining table to provide that visual separation with a pop of lightness. 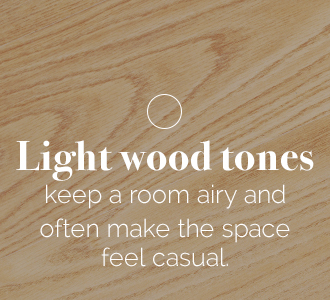 Light wood tones keep a room airy and often make the space feel casual. Light wood floors tend to take on a neutral tone, but some lighter woods do have warm undertones. Check for a strong yellow or red undertone. If you don’t notice one, your light floors are neutral, and you have a lot more freedom with mixing. If you do notice a red or yellow hue, stick with other light woods that have the same color undertones. If you want to use light furniture with light flooring, try to find slightly different wood tones to create some contrast. You might choose wood pieces a shade or two darker than a very light floor, for example. This adds dimension and interest to the space while making certain elements pop, but you still keep the overall look of the room light. You can also use a rug to separate the light floor from the light furniture. 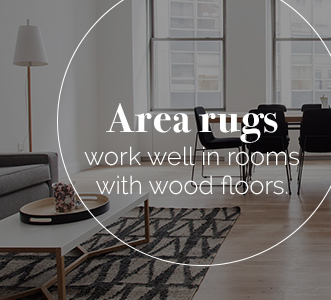 Opt for a darker colored rug to build contrast that helps create more dimension in the space. Your accessories also help balance out all the light wood. Work in some different materials and accents to contrast with the light wood elements. The colors don’t have to be dark or intense. You might add a soft green or blue for a touch of color without being too loud. One of the easiest options for matching is dark wood with light wood, whether that means light floors with dark furniture or dark floors with light furniture. Sometimes if you try to pair two dark woods or two light woods, the results look like you tried to match the colors but failed. When you go with one light and one dark option, it’s clear that you weren’t trying to match the wood finishes. Wood matching isn’t only an issue indoors. Choosing wood furniture for your outdoor space can be a challenge if you have a wooden deck. The same rules apply to pairing wood finishes outdoors. If you choose the same finish on the furniture as you have on your deck, the pieces may not look the same. That’s especially true if the deck is older and the furniture is brand new. Over time, the weather, sunlight and other outdoor elements take a toll on your deck. The appearance changes. When you purchase brand-new wood pieces, the finish looks fresh and new, so it won’t look the same as the deck anyway. Instead, choose wood furniture that is either darker or lighter than the wood finish on your deck. The contrast lets your beautiful new furniture pieces stand out prominently on your deck. Just like your indoor furniture picks, outdoor furniture should have the same undertones as the deck to create a cohesive look. You can add other contrasting elements for additional visual interest. Complement your wood theme with metal or stone decorative elements, for example. You can add color through potted flowers on the deck. Area rugs designed for outdoor use can also help break up the wood colors by providing a buffer between the two wood finishes. AmishOutletStore.com is an authority in the solid wood furniture industry. If you’re looking for wood furniture pieces that work with your hardwood floors, we can help. Request a quote for the new furniture pieces you need today.